Deborah’s background is in professional art practice and education (teaching Fine Arts at Tafe NSW and Charles Darwin University NT). Her approach to creativity is broad, working in a variety of media from traditional drawing and painting to digital imaging, photography and creative writing. An active member of the vibrant Alice art community, she exhibits in Alice Springs and interstate. Her most recent solo show, Palm Valley & Environs was held in the gallery space at Olive Pink Botanic Garden, Alice Springs, In 2018. Her 2016 exhibition, FLORA – The Alchemy of Playing with Plants was at the June Marriott Galley in Alice Springs. ‘Up in the Air’ a very successful solo show was at Araluen, the Regional Gallery in Alice Springs In May 2013. Previous shows were in March 2007 at Gallery Gondwana in Sydney and then again in May 07 at Araluen. In between these shows she has contributed to numerous group exhibitions here in Alice Springs, including the prestigious Alice Prize. Her short story writing and poetry has been included in several published anthologies. Deborah brings to her role as teacher an empathic understanding of the creative process, and professional knowledge of a broad spectrum of art media, including new technology. A willing communicator, and natural teacher, she enjoys the process of helping her students realise their creative potential in whatever medium they choose to work. 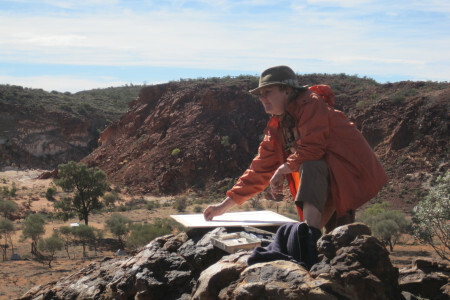 With her partner Dr Charlie Carter, Deborah runs fully supported camps for artists, art students, writers and photographers in beautiful, remote parts of Central Australia, during the cooler months. The camps cater for people at all levels of creative experience. Deborah offers support and tuition to those that want it while others choose to work idependantly on their own projects, In operation since 2008 the business is called Larapinta Creative Camps. Information can be found at www.larapintacreativecamps.com.au. 2008 Exhibitor Alice Art Prize, Araluen Gallery Alice Springs NT. 2006 The Other Side of Two mile Araluen Gallery Alice Springs NT. 2005 Desert Divas, Gallery Gondwana, Alice Springs NT. 2004 Exhibitor Alice Art Prize, Araluen Gallery Alice Springs NT.